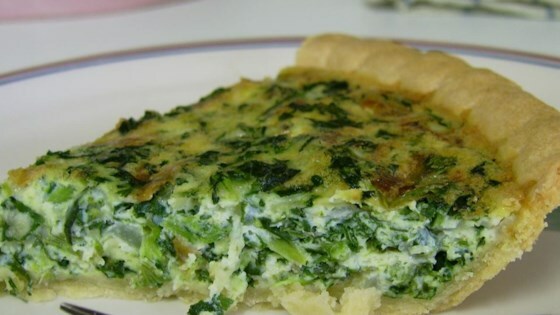 "My kids love this easy quiche. I serve it with fresh cantaloupe for a light weeknight supper or weekend lunch. Enjoy!" Preheat oven to 350 degrees F (175 degrees C). Bring the pie crust to room temperature. Heat the olive oil in a skillet over medium heat; add the onion and cook until onion becomes transparent, about 5 minutes. Combine the spinach with the onion, cover the skillet; turn off the heat, and set aside. Unroll the crust and press to fit into a 9 inch pie plate. Trim the edges. Beat the eggs in a large bowl until light colored and frothy. Add the garlic, thyme, basil, cheeses, and spinach mixture, and stir until well blended. Season to taste with salt and pepper. Pour the spinach mixture into the prepared pie crust. Bake in preheated oven until the top is golden brown, and an inserted tooth pick comes out clean, about 50 minutes. See how to make this easy, top-rated spinach quiche. My two year old, my husband and my mom all loved this recipe. I will definatetly make it again. Very good. I had enough for two quiche pies, but the garlic was a little much. (And I like garlic). Next time I will use just a dash of garlic powder instead of a clove fresh. This was fantastic!! My kids loved it!! I will definitely be making this again!! This was my first time making a quiche and I was really happy with the results! My kids ate it right up!